Where is the Supreme People’s Court headed with judicial committee reform? The 1995 conviction of Tian Weidong, Chen Jianying and others in Hangzhou, Zhejiang. For this reason, judicial committees are important to anyone involved with or concerned with the Chinese courts, whether as a lawyer, litigant, or representative of a foreign or international organization, NGO, or government. The Third and Fourth Plenum Decisions both mentioned judicial committee reform but without any details. The Court has revealed the direction of its thinking on this topic in two recent articles published this month (December, 2014) on the national court website. The reason that the panel that hears the case must follow the decision of the judicial committee is that judicial committees are designated as the “highest judicial organ” within a court and implement the principle of democratic centralism. They decide cases that are too difficult or important for an individual judge or judicial panel to decide, to ensure the optimal substantive result (as seen from the institutional perspective of the courts. Judicial committees have long been criticized by the academic community both inside and outside of China, and some judges have written about their drawbacks as well. Judicial committees operate under 2010 regulations that I analyzed in an earlier article (Reforming judicial committees). (According to those rules, major cases such as death sentences must be approved by a court’s judicial committee, so judicial committees must have been involved in the mistaken cases mentioned above). (For those interested learning more about the operations of the judicial committee of a local court, I highly recommend the study linked here). Reform the trial committee system, perfect case handling responsibility systems for presiding judges and collegiate benches, let those hearing the case judge, and those judging the case be responsible. Clarify the duties of all levels within judicial organs and complete internal mechanisms for supervision and check. Internal personnel of judicial organs must not violate provisions to interfere with other personnel’s handling of cases, establish recording and accountability systems for internal personnel looking into cases. Improve case handling responsibility systems for presiding judges, collegial panels, … to implement a system where the person handling the cases bears responsibility. 2.Judicial committees decide cases in conference, which involves a wide range and large number of cases. Although the 2010 regulations require the judges that heard the case to prepare a written report, Judge Wang notes that judicial committee members have neither the opportunity nor the time and energy to learn more about the specific circumstances of each case. The committee has a large number of members (court president, vice presidents,division heads and some specialist committee members, and the local procurator), which means each case receives limited discussion time and and the views of defense counsel are not properly considered. 3. 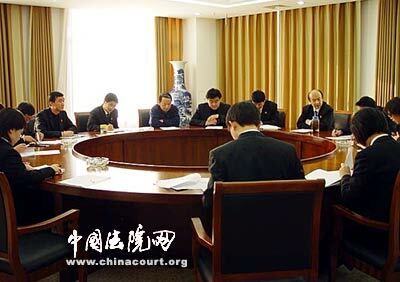 The members of the judicial committee include heads of the criminal, civil, and administrative divisions of a court, but with the greater complexity of Chinese legislation and the cases coming before the courts, and the fact that each member of the committee receives one vote, it is difficult to ensure that the resulting decision will be fair and appropriate. The solutions that she suggests are in line with (and more pointed than) those suggested by President Zhou Qiang, whose remarks need to be appropriate for the wide range of Chinese courts. 1. Judicial committees should provide a macro-level guidance to judges. Given the increase in a broad range of litigation, judicial committees should use their authority to select typical cases, summarize best practices, and issue normative documents. 2. Judicial committees should reduce the number of actual cases that they decide. Judge Wang suggests (as have others), that the standard under which cases are submitted to the judicial committee are too vague, and more specific guidance should be drafted. Cases in which evidence is disputed should not be submitted to a judicial committee. 3. Judge Wang recommends that criminal cases that judicial committees discuss should be limited to ones in which the evidence is clear, and most cases should be decided by the panel that has heard the case. In death penalty cases, a vote of 2/3 of judicial committee members should be required (rather than a simple majority), because this is more consistent with national death penalty policy. 4. The members of the judicial committee should be selected for their professional competence rather than their administrative rank. 5. Judge Wang suggests the decision making process should be changed, so that members are required to state their view and rationale before voting. 6. Judge Wang advocates that the procurator not be a member of the judicial committee. In her view, this violates the principle of independence of the judiciary and interferes with justice. President Zhou Qiang links judicial committee reforms to principles of judicial responsibility, suggesting that judicial committee meetings be recorded and judicial committee members assume responsibility for their decisions. We can expect these judicial committee reforms to take firmer shape in the medium term. While President Zhou Qiang mentioned that the Court will take the lead in implementing some of these judicial committee reforms, according to recent press reports, these will also be incorporated into some of the local pilot projects. This entry was posted in Court Operations, Court Reform, Recently in the Court, Structure of the Court and tagged judicial committees.